Full Moon beach yoga + Pez Vela-double shot. 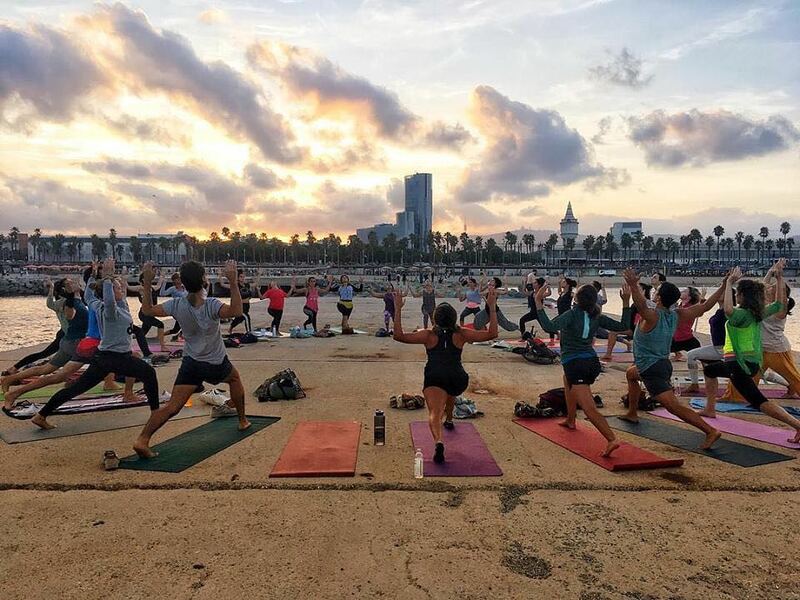 Boost your lunar energy this Friday night with beach yoga followed by local kitchen mastery and cocktails by the water. START: Full Moon Yoga, Espigón de Cemento in front of Hospital del Mar. (the one on the left side facing the sea), Espigó del Gas, 08003 Barcelona. FINISH: Pez Vela, Passeig del Mare Nostrum, 19, 21, 08039 Barcelona. 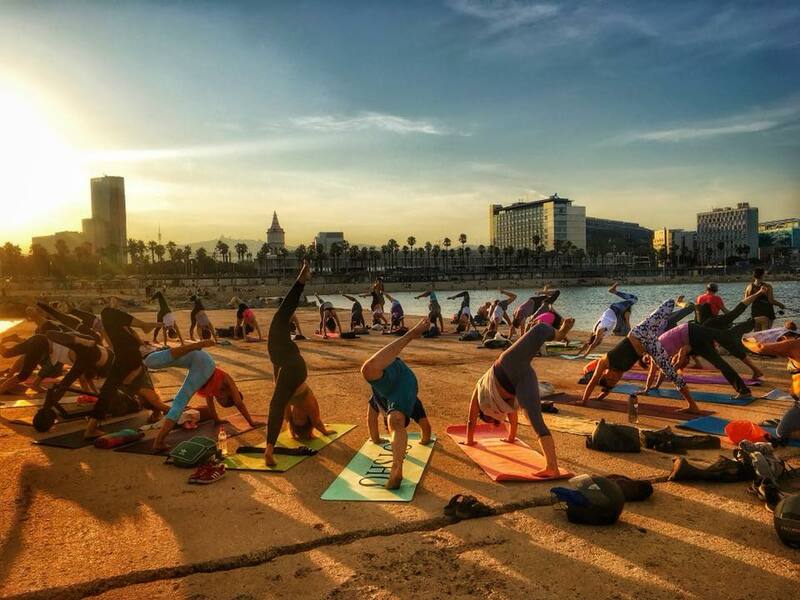 THE WORKOUT: Friday 19.30pm Full Moon Yoga Flow on the beach with Mafe. Every full moon offers an opportunity to fill yourself with the feminine energy of the moon. And now in this flow class you can. Class begins by awakening the body with Chandra Namaskar, greeting the moon. A strong Vinyasa flow focusing on opening up the heart chakra to allow more energy to flow there follows. All levels are welcome so don’t worry about being a pro. Let Mafe lead you through classic Hatha yoga moves; sun salutes, empowering standing poses and especially back-bends to open up the heart. You will find that your wheel pose never feel so strong and your heart so full of lunar life. Practise closes with some restorative Yin Yoga, where poses are held for longer periods to help the body relax and surrender to the lunar energy. FYI: Remember to bring your own mat and something warm for the relaxation. THE FOOD: Usually we avoid the beach chiringuitos. They tend to be overpriced with disappointing cooking. But Pez Vela is a diamond in the rough and the perfect location right on the water underneath the grand W Hotel. It’s interior is spacious and beachy in style, with an open kitchen so you can look in on the action. The things to order here are the tapas and quality rice dishes. They have lobster, black cuttlefish rice, vegetable and even a more experimental sausage and mushroom rice, all delicious and deeply flavoured. On a Friday night you might just feel like ordering small plates and drinks as you sit out on the terrace admiring the views of the sea and the city. 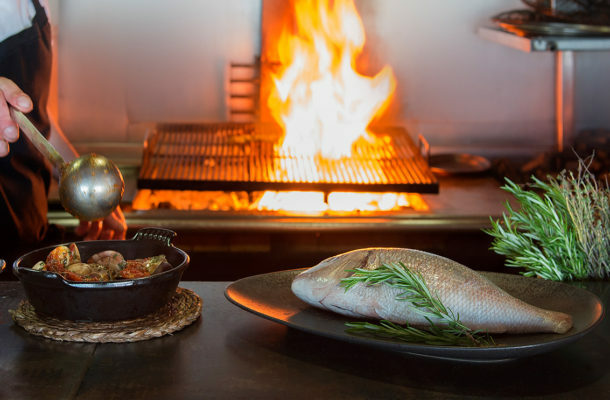 All the ingredients here are high quality; from the typical coca bread drizzled with oil and tomato, cold cuts of Iberian ham and all the seafood is freshly caught that day. Other things you might enjoy include the croquettes; packed with flavour, crispy and hot, clams with chilli and basil and grilled asparagus served with a spicy tomato Romesco. End on a sweet note with the home-made creme caramel or the fresh fruit with lemon, mango and passion fruit sorbet gives dessert a healthier twist. This is Friday night done right; excellent food with amazing views, right on the beach, that doesn’t leave you with a scary bill at the end. THE PRICE: A drop-in class is €10. Pez Vela: Set menu €35 gets you mixed seafood paella, pan con tomate, glass of wine, water, coffee and dessert . Tapas start around €10, Lobster rice €27, Sausage mushroom & asparagus rice €19, vegetable rice €16. Desserts range from €4.5-6.5. Drinks: wine by the glass is around €3 and bottles range from €14-€25. BEST FOR: Filling up on natural energy and perfect views for a relaxed Friday night. Sophie Heywood 21 March 2019 Bistrot Levante, Placeta de Manuel Ribé, 1, 08002 Barcelona.